It was three years ago next month that I crashed my first Old-Time jam session. I loaded my mandolin and meager repertoire of a dozen Old-Time tunes and nervously headed down to MacLeod’s Brewery in Van Nuys. What I encountered was a welcoming, gracious community of Old-Time musicians of all possible levels and it was just sheer dumb luck that David Bragger and Susan Platz sat down next to me at this first jam. I was absolutely blown away by the tight double fiddle tunes that the two of them played and I recall asking Susan if she was familiar with the classic Nonesuch record Folk Fiddling of Sweden of twin melody and harmony fiddling. She was not but even three years ago, you could hear the foundation being laid for what would become King’s Lament, the first recording of exclusively Old-time fiddle duets. King’s Lament is a wonderful and important addition to the canon of Old-Time recordings featuring David Bragger’s powerful melody playing and Susan Platz’s sublime rhythmic harmony playing. King’s Lament features fifteen classic and rare Old-Time fiddle tunes from the likes of Ed Haley, French Carpenter, Sarah Armstrong and Mel Durham to name a few. Local fiddler Nick Bachmann illustrated the cover and disc art with hand lettering by Kansas fiddler Tricia Spencer. Additionally, the comprehensive 24 page booklet of liner notes is liberally illustrated by Texas fiddler Howard Rains, including portraits of many of the source fiddlers. I sat down with Susan and David at the home of The Old-Time Tiki Parlour earlier this month to discuss their new recording. Pat Mac Swyney (PS): First off, what was the inspiration to make a strictly Old-Time fiddle duet record? 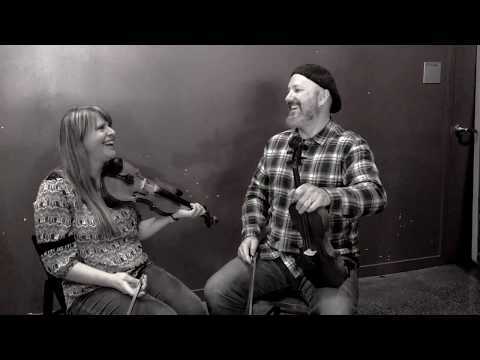 Susan Platz (SP): It’s such a beautiful sound and we love the sound of double fiddle harmonies. We had heard other musicians that we admire do it; maybe a track or two on an album here and there. Also, Tricia Spencer & Howard Rains who are doing a lot of fiddle harmonizing but usually with a full band behind them. 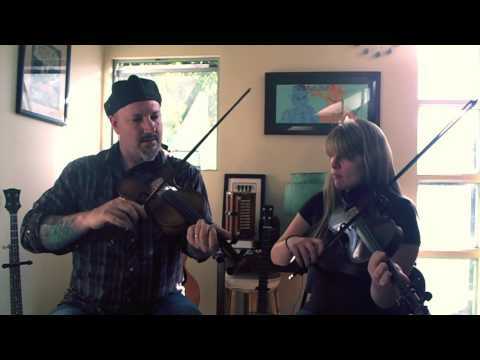 We realized it would be nice to play paired down as just two fiddles. cassette tape of Dan Gellert and Brad Leftwich. Anyone who’s heard their Kansas City Rag would admit they were also blown away by all of Dan’s fiddle movement around Brad’s melody. Between these, there has been a lot of inspiration there. Also, when we got the Tiki Parlour started, I started to interact with more musicians who were experimenting with it like Rafe and Clelia Stefanini and, of course, Howard Rains & Tricia Spencer. So that’s what got the wheels spinning and Susan just naturally loved doing it. PS: You’ve mentioned a few old recordings but is there much of a historical precedent for Old-Time fiddle duets? DB: Aside from Dennis and Sady who recorded numerous tracks, it’s typically an occasional experience. On different records, there might be a few tracks of this. What excited me was the thought of doing an album of strictly fiddle duets which to our knowledge has never been done in Old-Time American music. PS: Can you tell us a little about your respective musical backgrounds? SP: I have played violin since I was 6 years old. I continued playing classical through high school. I also sang in choirs from a young age and then majored in voice in college. I put down the violin for a few years until I moved to Los Angeles. DB: You were also really involved in dance and encountered some fiddle music through dance. SP: Yes, I dabbled in Swedish dance and square dance and learned some of the music. DB: I grew up listening to all kinds of music and as a teenager, I started branching out listening to different types of world music and traditional music forms caught my interest. Listening to Mississippi John Hurt as opposed to Eric Clapton really drew me in and I began listening to more and more rustic types of music from around the world. This drove me to seriously study North Indian Classical music on the sitar for many years until I inherited my great uncle’s fiddle. I simultaneously began learning the banjo, so I set the sitar down for good at that point. I started playing fiddle without a teacher but the more I played, the less I sounded like an Old-Time musician. I went all the way to West Virginia before someone finally suggested that I take lessons from someone who understood bowing and they named Tom Sauber here in L.A. Tom became my teacher and my entire musical life changed. Literally overnight I knew I was on a path to understanding how to play and how to learn fiddle through bowing and haven’t looked back since. During this time with Tom, I also travelled east to spend time with older musicians, most of whom are gone now. I also learned from senior fiddler Mel Durham here as well, so between Tom and Mel, I got a good handle on traditional playing and repertoire. PS: How did the two of you meet and start playing together? SP: We met at the California Traditional Music Society’s Equinox Festival in 2010. I knew I wanted to get more into traditional fiddling but wasn’t really sure where I wanted to be. I was taking Irish lessons and was playing in a contradance band. It was fun but I could never get the sound I wanted. I had heard of David and took his workshop. He was teaching Paddy on the Turnpike by Lee Hammons and fireworks went off for me. That was my turning point. I approached David afterwards about taking lessons and as it turned out, I lived a few blocks from him. My first gig with Sausage Grinder was in 2012. I apparently made the cut and over time we played a lot together so the fiddle duets came about rather organically. DB: What I loved about Susan was that she was really interested in learning the bowing and I am all about rhythm & bowing so she instantly stood out as a student. PS: What led you to make this recording? DB: It percolated in my over the years, recording absolutely stellar Old-Time musicians for my record label The Old-Time Tiki Parlour. I had been entrenched in recording the best of the best Old-Time musicians and got to the point where I was chomping at the bit to try something new, as well as old. PS: Can you share your approach to the harmony/fiddle seconding on this recording? SP: I will say that it was very collaborative with David playing the melody and me testing out different things and we would then hone it together. I guess I could say that I was trying to channel a guitar; essentially honoring the traditional style and harmonies that would be present in Old-Time guitar while also putting our own creative stamp on it. DB: I liked that Susan’s 2nd fiddle was playing like a guitar but unlike a guitar there is much more freedom for rhythm. I liked the jumping back and forth between chordal drones with all kinds of rhythmic things happening; ascending and descending bass runs and Susan would throw in tight little phrases with outside the box harmonic ideas. When I started playing Old-Time, I listened to a fair amount of Irish and Swedish fiddle music so a huge part of this was to also channel the sounds we hear in northern European double fiddle music and bagpipe music. PS: Can you share some of your personal favorite tunes on the album? SP: Paddy on the Turnpike was the first tune I ever learned from David. It is a gorgeous, haunting piece and probably the least complex of my harmonies as it’s very droney. Banks of the Arkansas from Bruce Greene has also been one of my favorite tunes for a long time. DB: It’s also one of the first tunes we ever harmonized. SP: I was so daunted by the idea when David suggested it but then it came together. It’s just beautiful and hope that Bruce would approve of our slowing it down and making it a little more languid and mellow. I really like the story behind Admiral’s Choice. DB: Admiral’s Choice was named after my youngest daughter, Leela, aka “The Admiral”. I used to dabble in composing music including Bollywood but when I started playing Old-Time music, I became completely obsessed with the tradition and had no further interest in composing. With Admiral’s Choice, the timing just felt right so sat down and decided to give myself twenty minutes to compose this tune. I had been listening to a bootleg recording of African-American fiddler Will Adam and knew I wanted it to draw from him for general inspiration. I also wanted the tune to be modal and something I could teach my students that would cover a lot of technique. My favorites keep changing as they always have. Coal Holler is a really special tune in G major with a horrifically beautiful major 7th and a very fun tune to play. Rebel Raid is also one of my favorite tunes to play and one that I have played for a very long time. I learned it from Tom Sauber and it comes from one of the greatest fiddlers who has ever lived, Ed Haley. At the time we were recording, we were put in touch with West Virginia fiddler Bobby Taylor who is the custodian of Ed Haley’s fiddle which is literally the holy grail for Old-Time fiddlers. To be able to see it is one thing, to be able to touch it is another but to actually get to play it and have an amazing photographer around to take pictures of us with the fiddle was one of the great closing experiences of this project. To sum up, I’ve always had fond memories of this tune and now have a whole new set of memories. SP: Speaking to the title track, The King’s Lament was taught to me by David, my mentor, who learned it from his mentor Tom Sauber who learned it from Mel Durham so full circle. DB: It’s a very dear tune to me having played it many times with both Mel and Tom. PS: From cover to liner notes, the album art is visually stunning. Can you tell us a little about the artwork? DB: In the process of recording and producing several albums with Spencer and Rains, both music and art are such an emphasis for them. I knew we needed them on our Old-Time Tiki Parlour team. Howard is now doing a lot of the graphic design for us. The King’s Lament booklet of extensive liner notes is also chalk full of Howard’s artwork with paintings of many of the source musicians and his wife Tricia did the hand lettering for our cover. The cover art was painted by Nick Bachmann who is also a very gifted Old-Time musician and a professional animator who has worked with DreamWorks, Nickelodeon to name a few. Nick created the Old-Time Tiki Parlour logo as well as the Dan Gellert CD/DVD release and so we asked him to do our cover. SP: I also want to point out that on the cover, these are our actual fiddles down to the actual smudge on mine and the flowers pictured are the Illinois Violet for me alongside the California Poppy for David. The King’s Lament marks the tenth release from David Bragger’s and Rick Hocutt’s Old-Time Tiki Parlour and available here. Pat Mac Swyney is a local musician & teacher who currently plays Traditional Jazz with The SWING RIOTS Quirktette; Old Time with The DEAD ROOSTER Memorial String Band; and Balkan with NEVENKA.